Kelechi Udegbe, a budding Nigerian actor in the city of Lagos, features in this 6 part documentary drama series where he weighs his option of finding a suitable accommodation within his budget, thereby sparking a debate about new ways of accessing affordable accommodation and about the equitability of housing policies of Lagos State. 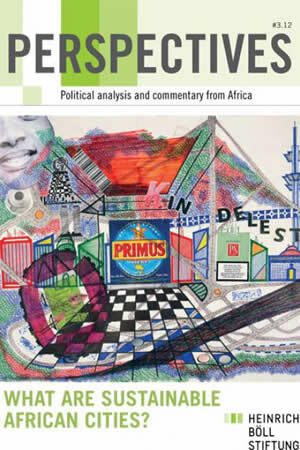 In the current discourse of possibilities for ‘African Urban Futures’, Lagos city is amongst the most highly contested. The preferred imagined future of Lagos is one which fronts a global, modern city, envisioned and realized through developments such as ‘Eko Atlantic’. However, there are implacable realities which exist alongside grand ‘Africa Rising’ narratives, and instead necessitate the provision of basic services and infrastructure. A modern city is a centre of opportunities for all – rich and poor – to reach their highest potentials, that is governed in an inclusive, collaborative and sustainable manner. Prof. Taibat Lawanson from the Department of Urban and Regional Planning and Dr. Ademola Omoegun from the Department of Architecture, University of Lagos aimed at understanding how affected people cope with the effects of government interventions for replacing informality with formal structures and how Lagos fares in embracing creative and innovative strategies of inclusive development initiated and implemented by the affected people. Market women and informal traders in Lagos contribute massively to the urban economy of the city; through payment of various taxes and levies but also through sustaining transport, construction, food and other sectors, even in times of deep recession. They contribute their share to the internally generated revenue and therefore should expect in return social services in form of local infrastructure, access to low interest credit etc. 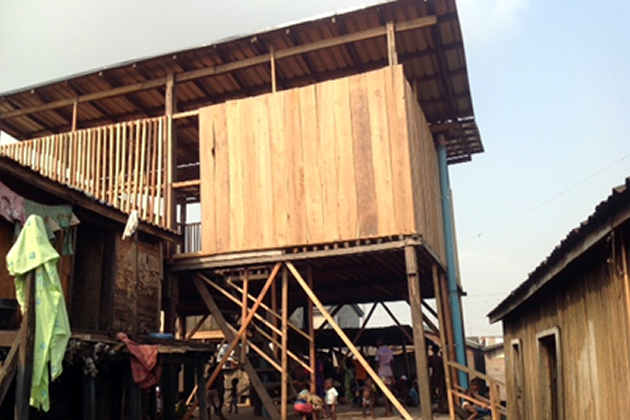 The approach of the Makoko Neighborhood Hotspot intends to demonstrate that low-tech, flexible, low-cost and strategic yet precise interventions can increase the share of urban consumers and taxpayers which again increases the city’s overall welfare – opposite to the often implemented top-down, investment intensive and heavily donor or elite-driven big-infrastructure solutions as they have mostly failed in (West-) Africa. Lagos is a city relying heavily on road use by private cars and public buses. With the growth of population, inadequate maintenance of the road network, badly maintained cars, insufficient public transport planning, and weak policies on pollution & climate change, roads are congested and pollution is on the rise. It is therefore timely to explore possibilities for introducing cycling as a sustainable non-motorized transportation mode for Lagos which also enhances mobility for the urban poor and increases interaction among nearly all groups. Just like investing in an efficient public transport system, investing in cycling entails social, economic and environmental benefits for cities. On December 12, 2015, the Makoko/Iwaya Waterfront Community celebrated the opening of the first neighborhood hotspot. The construction was initiated and supervised by Fabulous Urban, a Swiss architect and urban design firm, with funds from the Swiss Embassy Nigeria. Townplanner Aro Ismaila and Architect Mo Ajala completed the expert team and the community carpenters and artisans built the centre between April and September 2015. In its efforts to increase its internally generated revenue and to be less dependent from dwindling federal resources, the Government of Lagos made several unsuccessful attempts to tax small business owners in the informal sector, writes Adeolu Adesanya. It’s through a participatory approach that the Government finally succeeded in integrating the informal sector into its taxation system. The Makoko-Iwaya Waterfront regeneration plan is a comprehensive people centered development framework. The major objective is ensuring participation and community ownership. The plan looks at all facets of life and development. This plan, if implemented, could turn Makoko/Iwaya community into a worldwide showcase of a sustainable and flood-resilient lifestyle. LAGOS - A CLIMATE RESILIENT MEGACITY? It is widely expected that Lagos will become the largest city on the African continent within the next ten to fifteen years, surpassing Cairo. Being a melting pot of numerous Nigerian and West African identities, cultures and religions, Lagos has been offering millions of people dreams and hopes for a more prosperous future. As a coastal city with many of its parts lying just above sea level, Lagos faces the additional and peculiar challenge of flooding. Intelligent and innovative strategies are needed to combine the requirements of economic growth and infrastructure development with sustainable urban governance. The Heinrich Böll Foundation runs the Megacity Lagos programme from a liaison office in the City. Cutting across all projects, our partners emphasise the need to include Lagos citizens in urban planning and implementation processes at the local and State Government level. Our aim is to offer a discussion platform where ideas for a sustainable and equitable Lagos can emerge - so that Lagos would be called not only the biggest but also one of the most liveable cities in Africa. Megacity means mega challenges. This publication looks at answers to Lagos’ pressing questions, such as a rapidly growing population, managing the waste such a huge population produces, adequate and affordable housing at a time when flooding is making land uninhabitable for a substantial part of the year, job creation and transportation. Can Lagos become a model megacity? This edition of Perspectives asks, “What are sustainable African cities?”. In so doing, it offers a snapshot of Africa’s urban sustainability challenges, ranging from tensions between heritage and urban renewal.